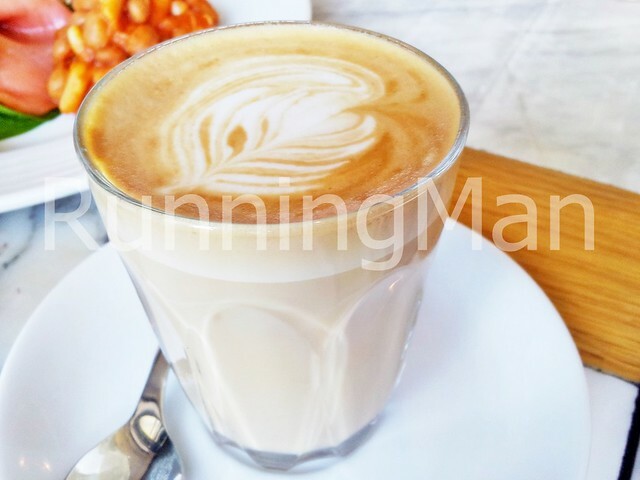 Within a welcoming and inviting atmosphere, Kith Cafe serves up fuss-free, simple and rustic home-cooked food and great tasting coffee. 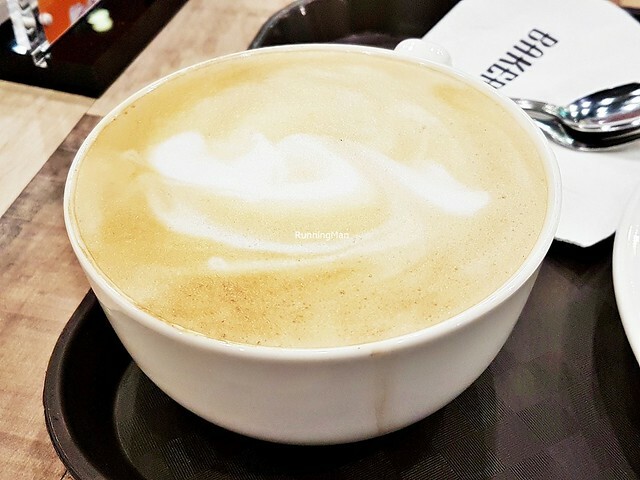 This makes Kith Cafe an extremely popular place to chill out, and weekends typically see all of their outlets fully packed. The informal ambience at Kith Cafe is enhanced by quirky custom-designed furniture, with square block like designs adorning the furniture and open storage shelves displaying their products. 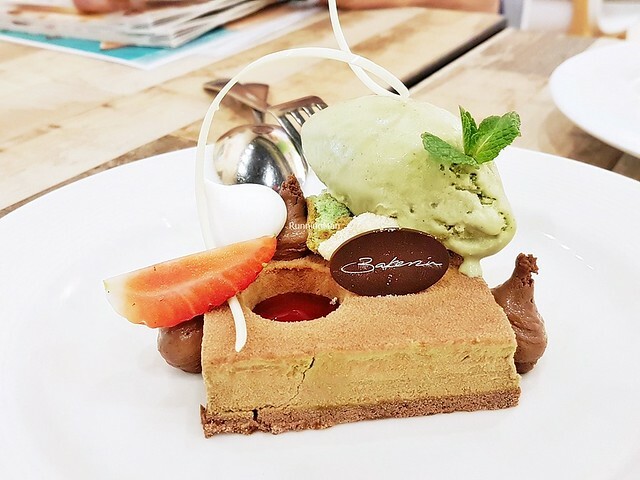 Despite a small floor space, Kith Cafe full maximises their interior to seat as many people as possible, without making diners feel cramped or uncomfortable. It also helps that their outlets typically have outdoor seating with good views of the surrounding area. 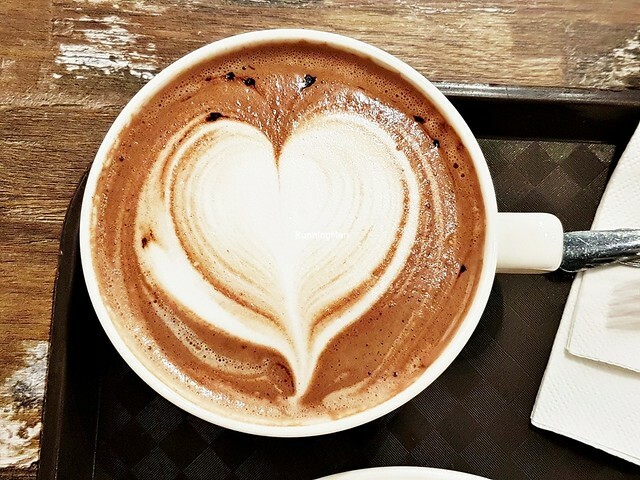 Service at Kith Cafe is warm and personal, even during busy peak periods. Staff take the trouble to check on your dining experience, and are more than willing to make suggestions. Good product knowledge as well. Food is served very quickly upon order, with very little waiting time. Kith Cafe does allow the option of corporate catering. Food at Kith Cafe is simple, rustic, uncomplicated, and served in large portions. Despite the generous helpings, prices are reasonable, comparable to prices in most other average cafes. 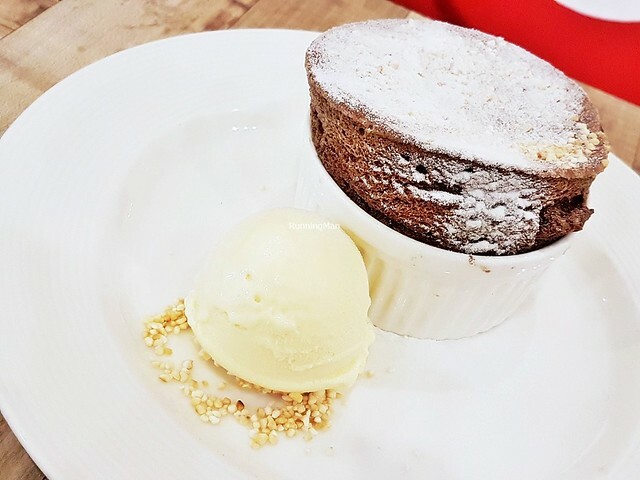 Kith Cafe takes pride in their original recipes, carefully sourced ingredients, freshly baked bread and pastries, and their distinctive blend of coffee. 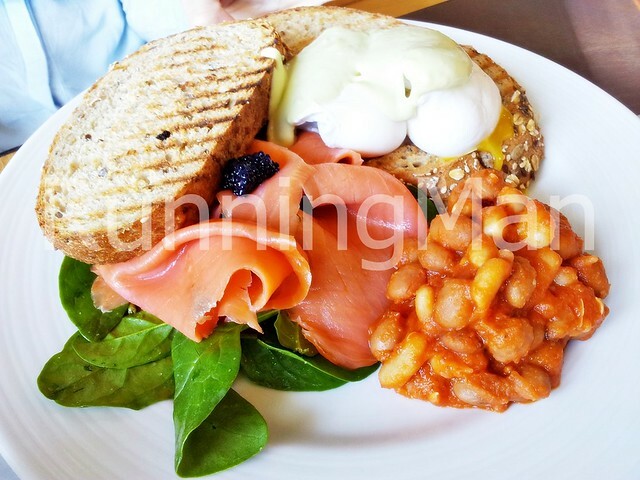 Dishes are flavourful and wholesome, and I would highly recommend Kith Cafe for brunch, lunch, and dinner! 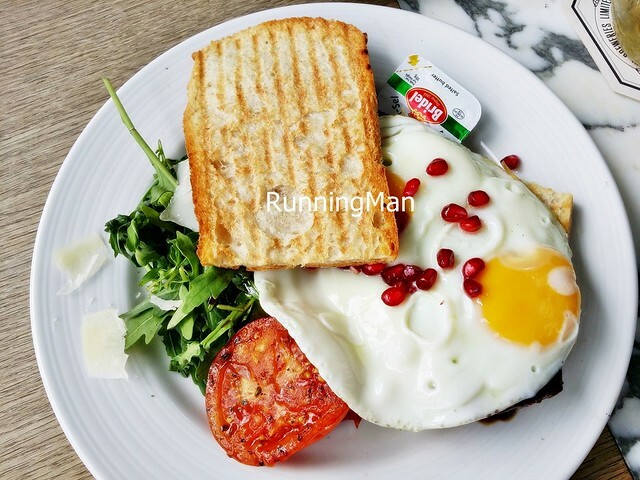 The Mexican Eggs consist of 2 perfectly poached eggs, topped with avocado and mayo, served on 2 slices of thick multigrain bread, with a bed of baby spinach. It's accompanied by smoked salmon, caviar and spicy tomato beans. Absolutely love the contrast of salty, smoky, savoury and sweet in this dish. 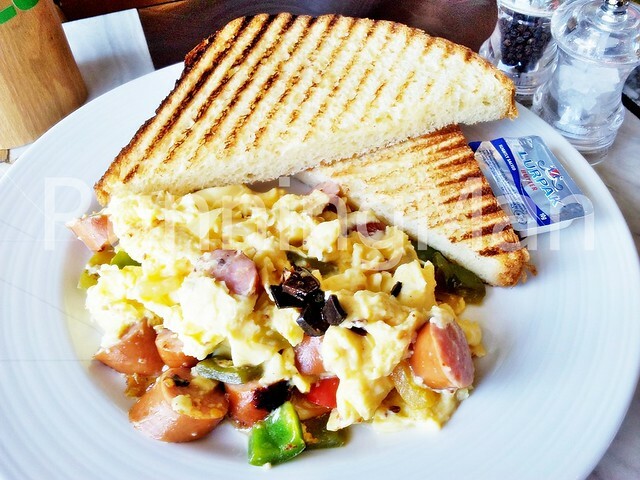 The Cajun Scrambled Eggs consists of a mountain of eggs scrambled with chicken bratwurst, which gives it a smoky flavour, and mixed bell peppers (Green, Yellow, Red) / capsicums, which lend a crunch to texture. Onions, mozzarella cheese, chili, 2 slices of brioche toast and shavings of black truffle round out this dish. Tasty, with the sweetness of the onions and bell peppers / capsicums, and earthyness of the black truffles. The brioche toast is soft, fluffy, and just melts in the mouth. However, the dish can get rather overwhelming due to the large portion. 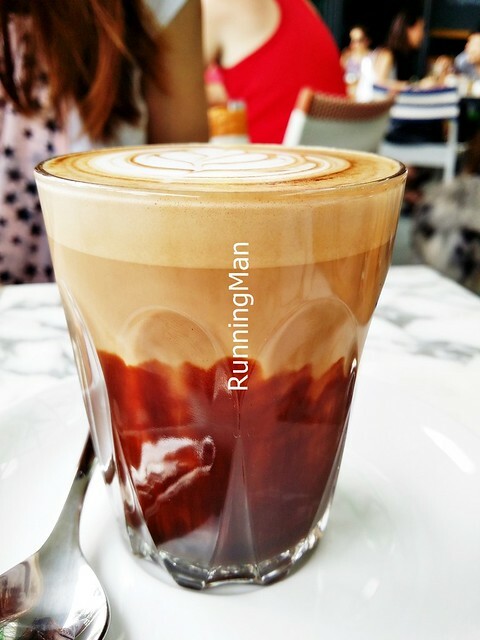 The distinctive 'not too weak and not too strong' coffee here is a house blend that attempts to bridge the Australian and Singaporean preferences for coffee. 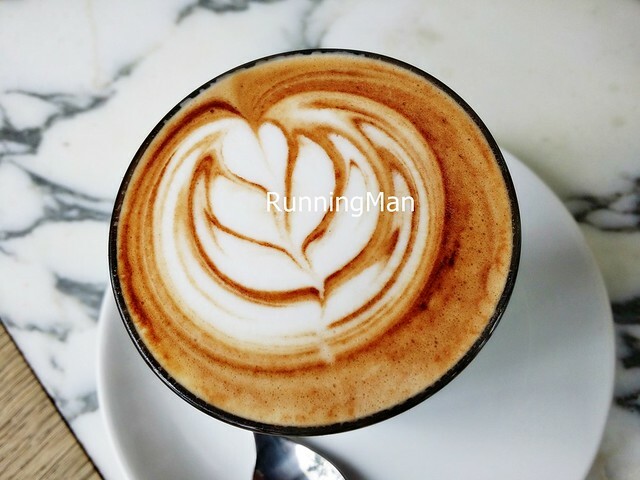 Both the Latte and Mocha are full bodied, with a slight bitterness, fragrant aroma, and a smooth texture. Left me wanting more! 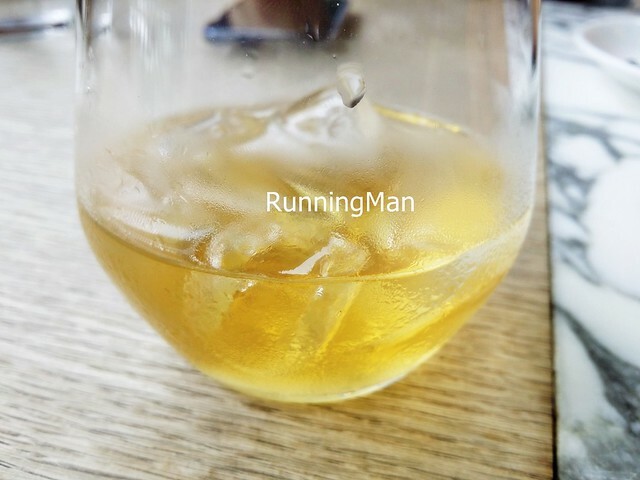 The Yuzu Umeshu is very good, at once sweet and strong, with the citrus taste of yuzu and a slight sour plum flavour. Light, refreshing and perfect as a dessert tipple. 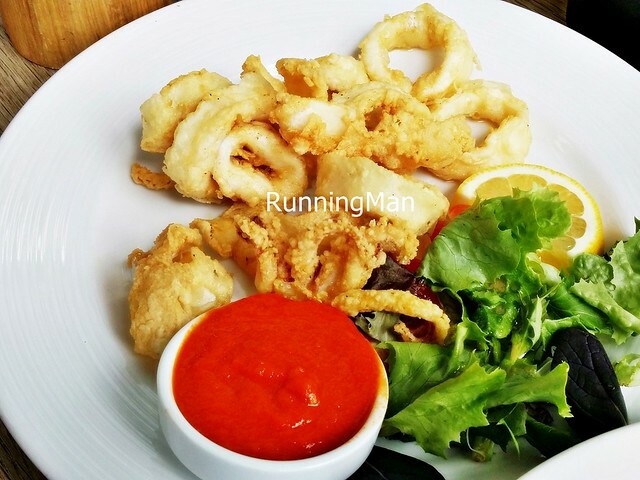 While I loved the freshness and firmness of the Calamari squid rings, the batter was limp and easily got soggy, not adding much in either taste or texture. Not so good. 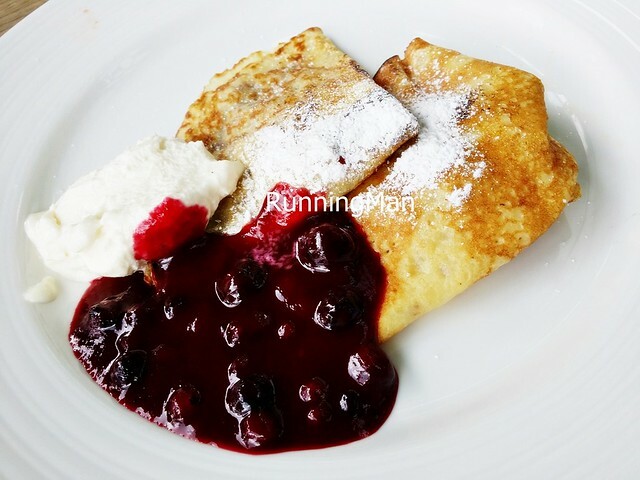 The Bananas & Mixed Berries Crepe is an interesting sweet combination of bananas stuffed in a light crepe, with a sauce of blueberries and raspberries. Sweet, tart and creamy all at once, this goes down well as a dessert, or for a sweet start to the morning. 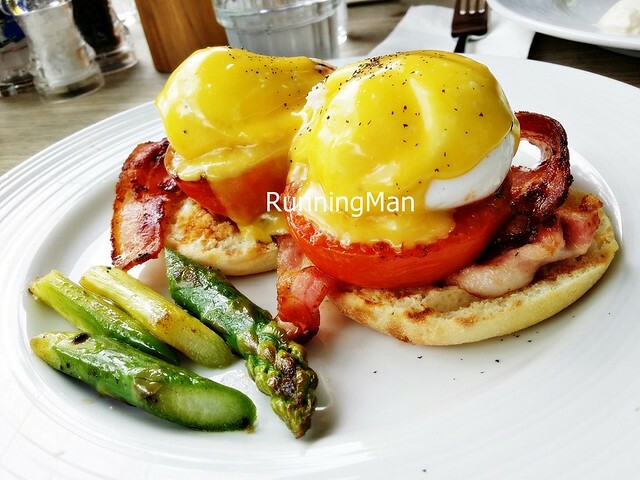 The Blackstone Eggs is a twist on the classic English Eggs Benedict, with a juicy grilled tomato replacing the sliced ham. 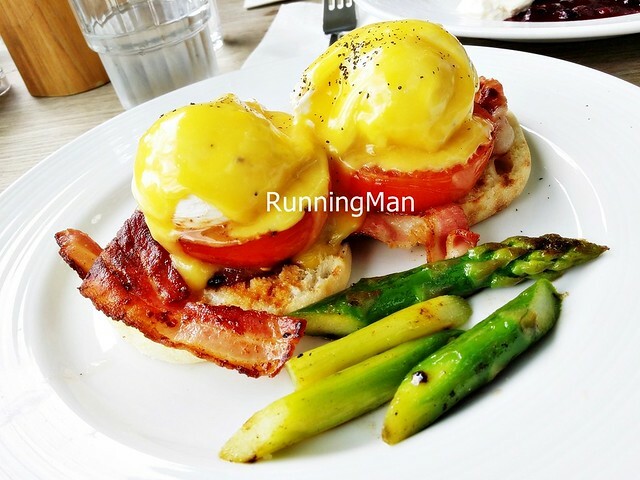 With 2 softy and perfectly poached eggs, whose runny yolks are best mopped up with the English muffins and crisp, smoky bacon, along with grilled asparagus, this dish is a notch above average. 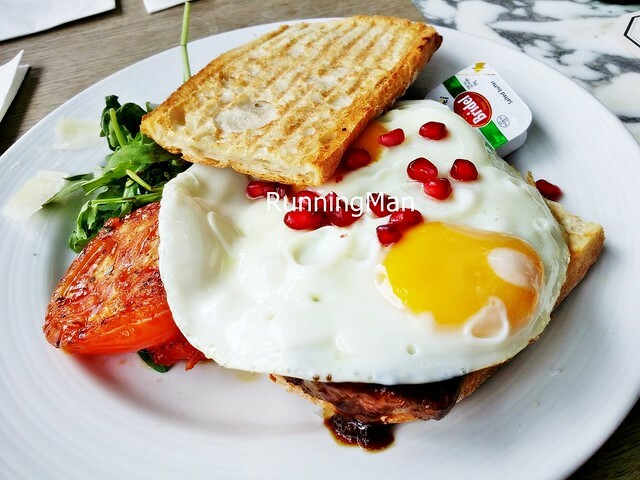 The Pork Belly Fried Eggs is a unique fusion dish of slow braised soy pork belly, rocket leaves, juicy grilled tomato, fresh crisp toast, and 2 sunny side up eggs. I loved that the pork belly has very little fat, and is served in a thick cut. The meat is tender, flavourful, and savoury, complementing the freshness of the rocket leaves and tomato. 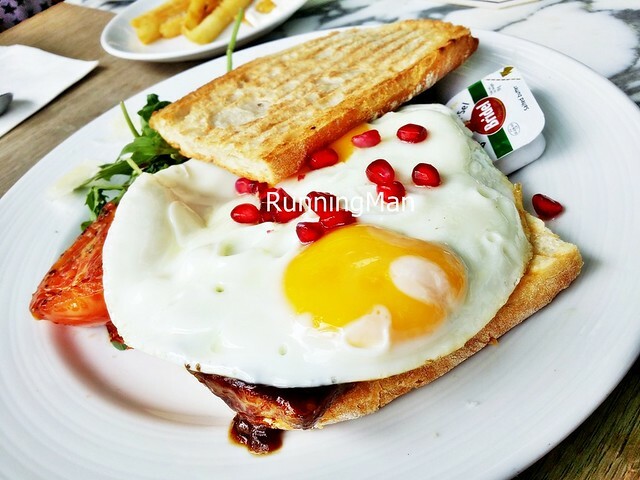 Pairing each mouthful with the crisp toast and lovely fried eggs is so delightful! Highly recommended! 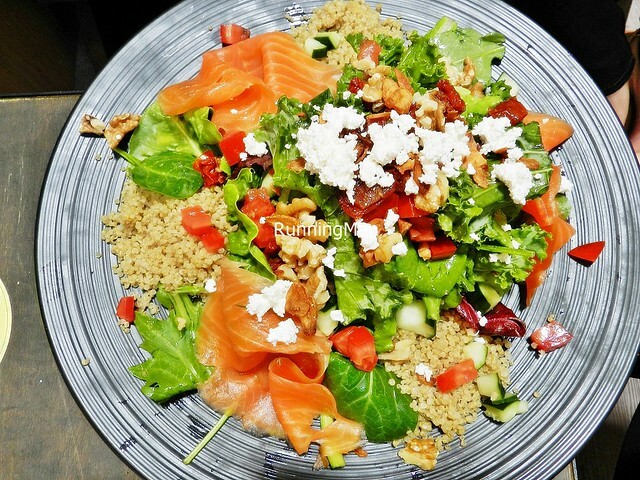 A very basic and healthy dish, the Smoked Salmon Salad consists of 3 components. 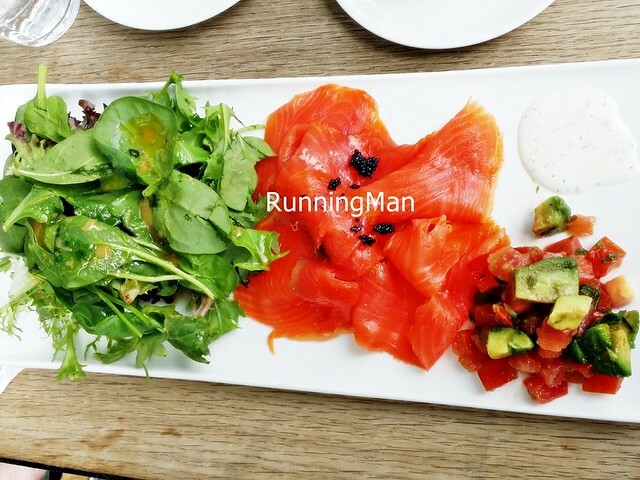 Fresh rocket leaves in a light vinaigrette, warm smoked salmon with caviar, and a salsa of avocado and tomatoes. Works well as a salad, though there isn't much cooking skill involved in preparing this. 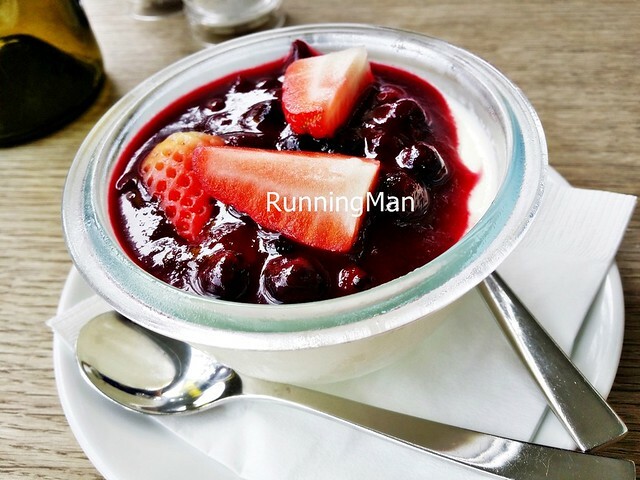 The smooth and creamy Panna Cotta is topped with blueberries and strawberries, and the lightness of this dessert is great to finish of a meal. Choose the doneness of your Wagyu Beef Burger, although I like mine medium to medium-rare. 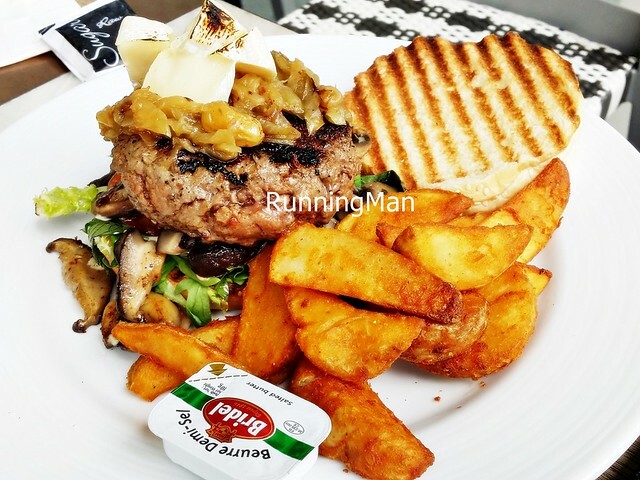 The excellent grade of wagyu beef and good grilling skill ensures the patty is tender and juicy, while the caramelised onions provide a sweet contrast. The freshness of the shittake mushrooms, lettuce and tomatoes, along with the crisp toasted burger buns and excellent patty make this a winner. 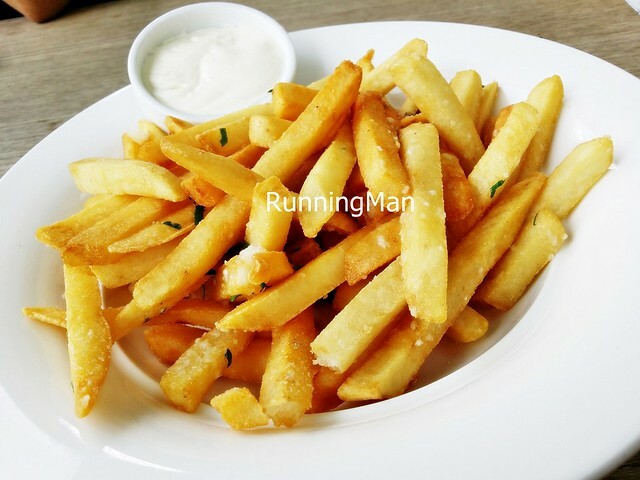 Truffle Fries lightly dusted with truffle oil and salt make this side dish very earthy and fragrant. Update May-2016: Returned to Kith Cafe after 3 years, and I'm pleased to say they're doing well, if not better, than before. Ambience at Kith Cafe remains chill, casual, and laid-back, calling to mind the Australian / Melbourne cafe culture. Service is decent, staff are polite and attend to diners quickly. Food remains rustic and tasty, simple Western style fare that is hearty yet healthy. Prices have remained affordable too. 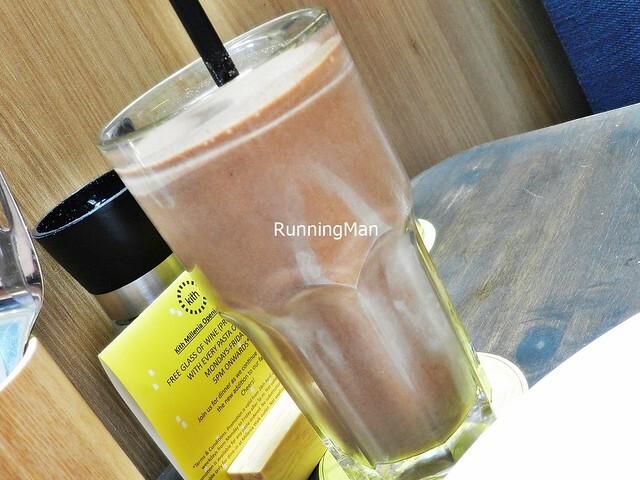 The Kith Breakfast Shake (SGD $8.50) is a healthy, filling, yet tasty milkshake beverage, made with chocolate powder, espresso, banana, digestive biscuits, and milk. 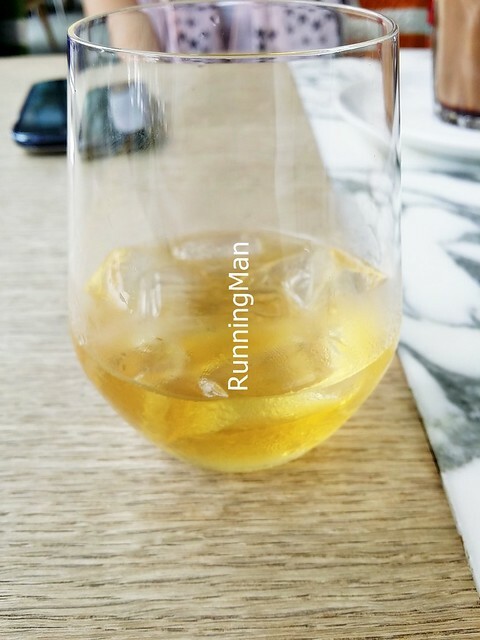 Chilled, refreshing, and with a light fruity sweetness, absolutely lovely! The Kith Kopi (SGD $4.50) tastes like a kopi-c, and I must commend the effort to make a Western coffee taste like an Asian coffee! 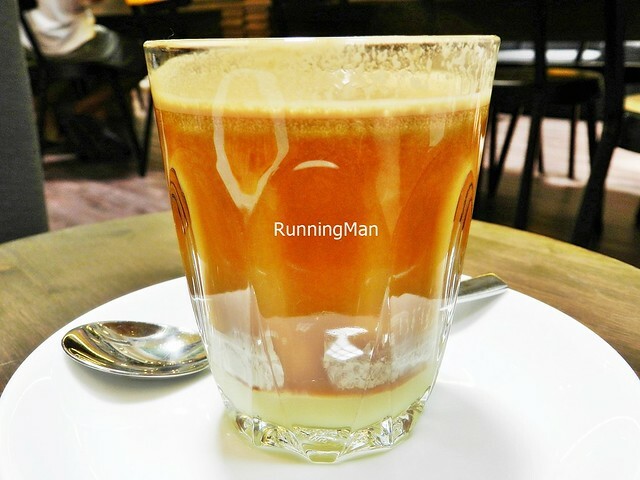 A blend of espresso and condensed milk, this fragrant beverage is smooth and milky, though the sour aftertaste is very strong. 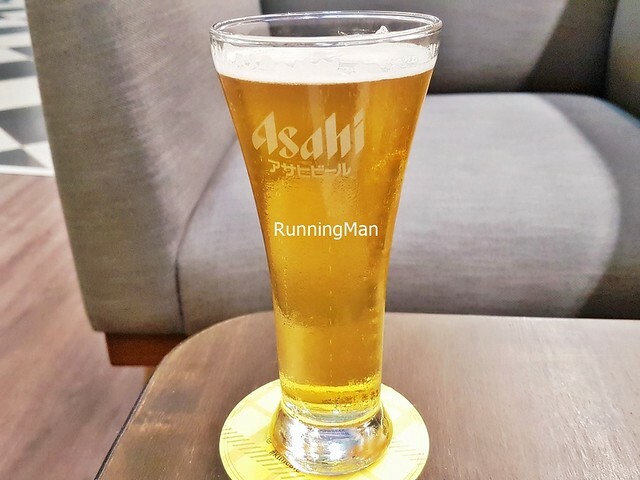 They offer a Beer Asahi (SGD $10) Super Dry, and when I dined here on a weekday, there was a promotion of 1 free half-pint with every plate of pasta ordered. 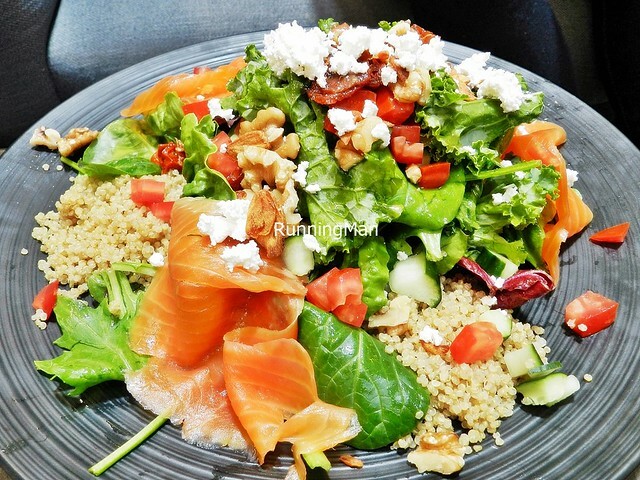 The Kith Super Salad (SGD $21) is a large, healthy, filling salad, a mix of crunchy lettuce, fresh spinach, kale, walnuts, cucumbers, juicy roma tomatoes, intense sun-dried tomatoes, grainy quinoa, fragrant roasted garlic, crumbly feta cheese, savoury salty smoked salmon, and a light tahini dressing. Super healthy, super tasty! 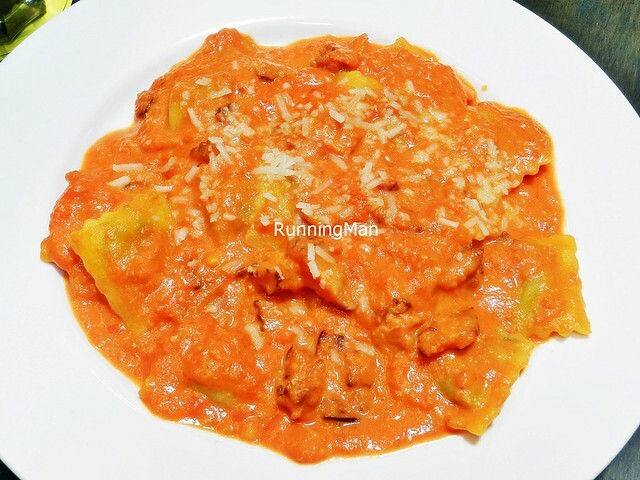 The home made Ravioli (SGD $20) here is pretty good, above average as a dish. 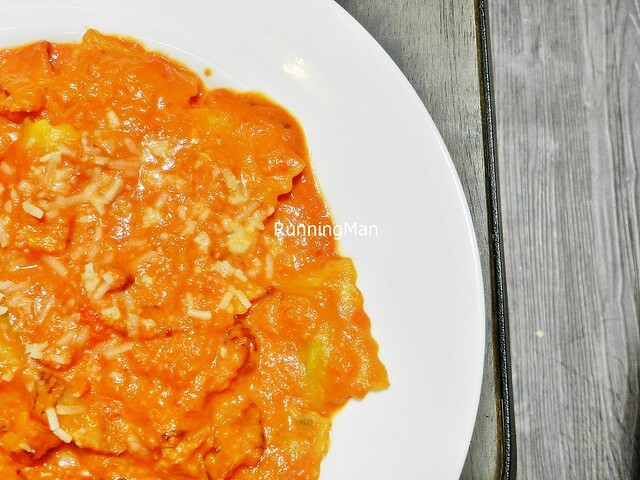 The tender squares of ravioli pasta are stuffed with spinach and ricotta cheese, but what makes this dish stand out is the fresh, savoury sweet tomato cream sauce, topped with parmesan cheese. I personally like it with a bit of chili heat! 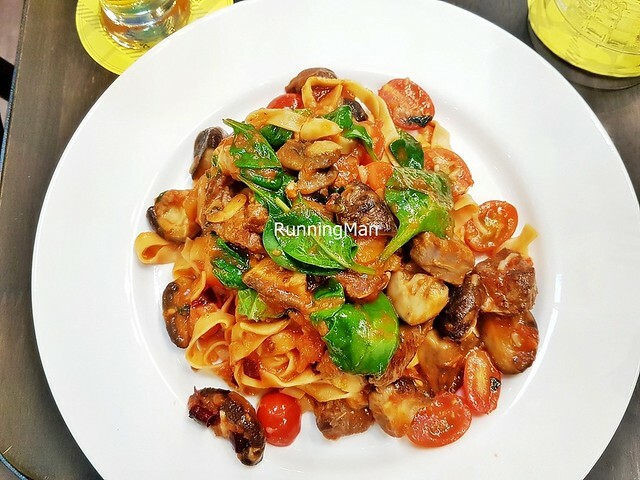 The hearty Manzo (SGD $22) pasta features house made tagliatelle pasta noodles, in a rich tomato and white wine sauce, garnished with juicy cherry tomatoes, tender earthy shiitake mushrooms, parmesan cheese, fresh spinach leaves, and savoury beef tenderloin cubes. 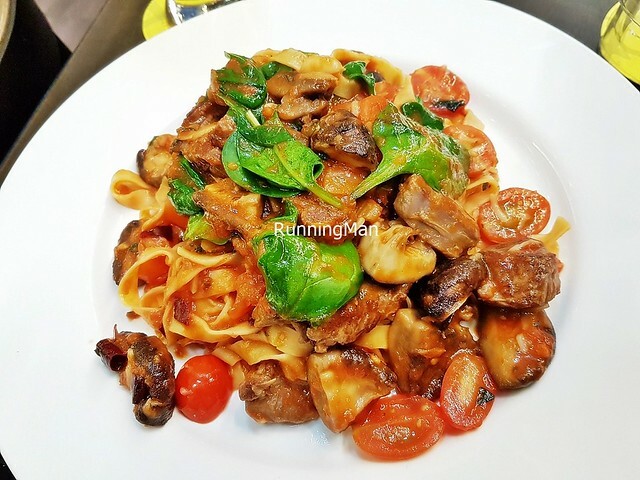 While I would have liked the pasta to be more al-dente, I loved the fork tender beef and mushrooms. Good! 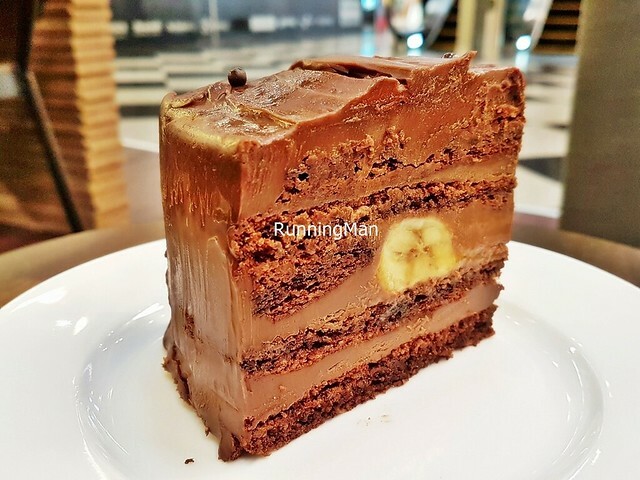 The large portion of Chocolate Banana Nutella Cake (SGD $8) is ultra rich and decadent, best shared! 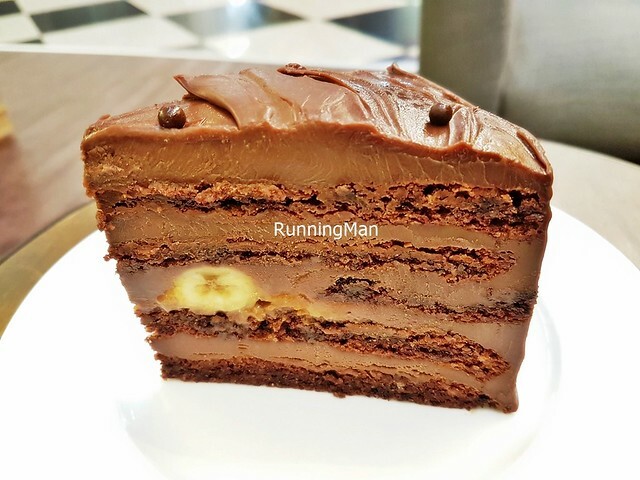 Loved the sweet, thick, luscious chocolate ganache glaze, the soft sweet banana chunk in the middle, and the moist texture of the chocolate nutella cake. So good, totally unstoppable, I just kept eating! Highly recommended! 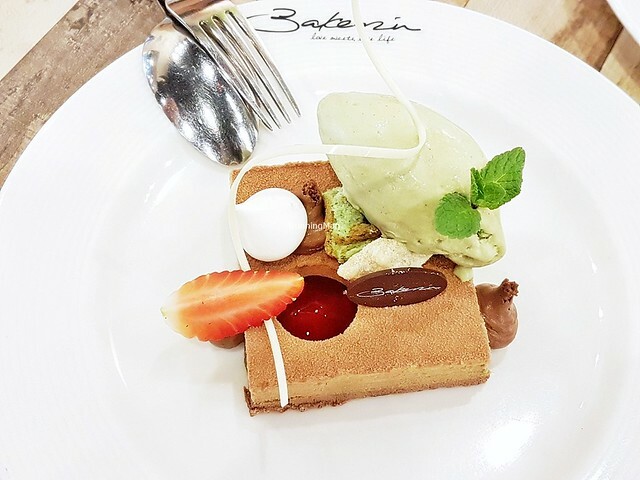 Previously known as Baker's Inn, Bakerzin is well known for its freshly made French inspired artisanal bread and desserts. The success of Bakerzin has led them to expand into the cafe business, serving up excellent Italian food at several of their outlets.Their unique and experimental bread and pastry creations push the boundaries of taste, creativity and style, and you're almost always assured of getting tasty treats that look beautiful. Ambience at Bakerzin is designed to look rustic and welcoming, with comfortable furniture, clean lines, high ceilings, and natural lighting. I like that staff at Bakerzin take the trouble to decorate the outlet according to seasonal themes in Singapore, especially for various festivals / celebrations. Service at Bakerzin is decent. Staff are friendly and polite, and able to carry conversations. Bakerzin staff will accommodate certain change requests as well. I did feel they look slightly rushed at times. 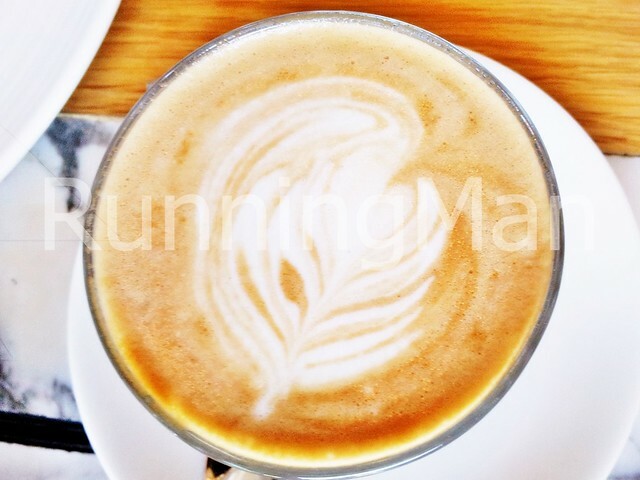 Good service, suitable enough for a cafe / bakery, but not memorable or outstanding. 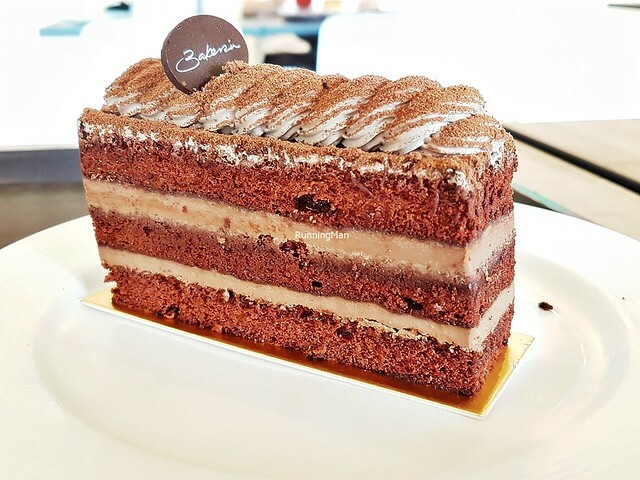 Breads, pastries and desserts are the highlight at Bakerzin. Their bakery churns out freshly made products daily, and part of the appeal is being able to see the chefs / bakers at work. 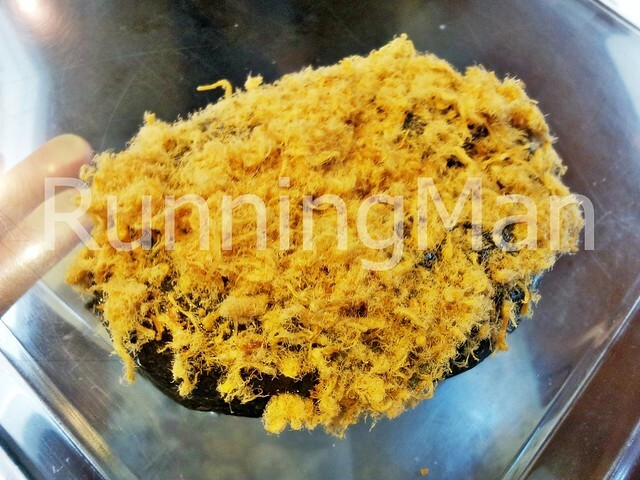 Flavours are superb, and prices are very reasonable for the quality you get. 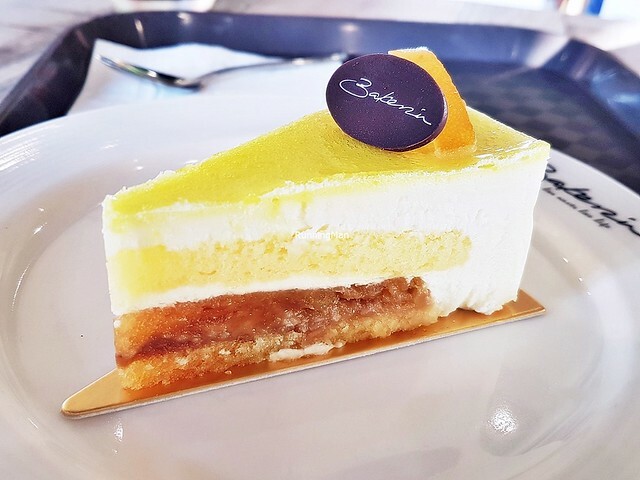 The menu in their cafe is rather limited, focusing more on sandwiches and pasta dishes, but the same high quality comes through in their food. Excellent, and I would highly recommend dining at Bakerzin! 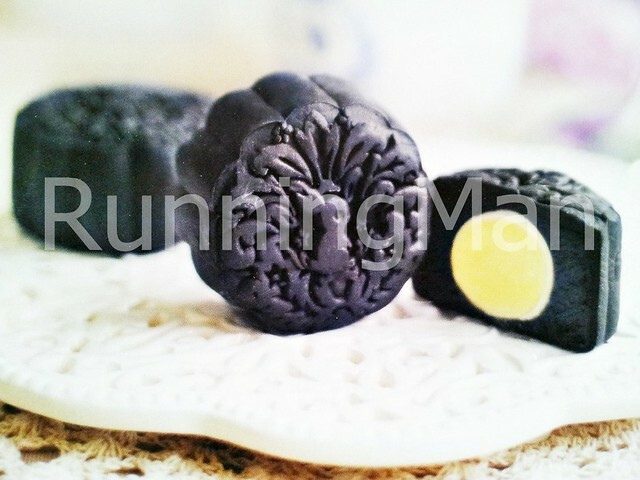 The signature Bamboo Charcoal Bun With Pork Floss has a dark hued skin as a result of squid ink being used. 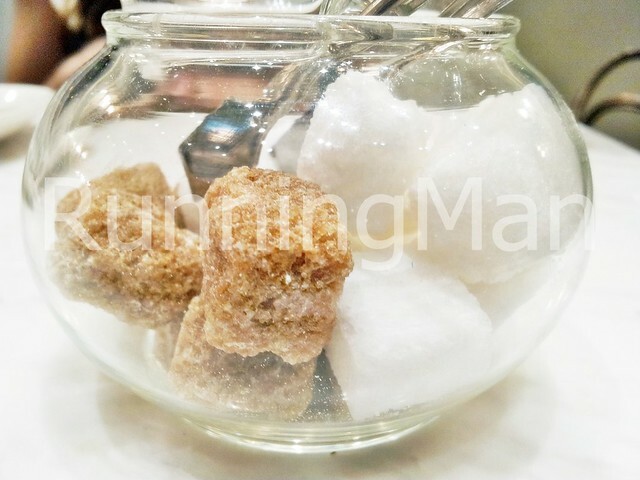 The topping of pork floss is generous and tasty, and the overall taste of this bun is slightly different enough from other pork floss buns, which makes it stand out. The large Tuna Puff has a nice helping of home made tuna spread within, and is slightly spicy. 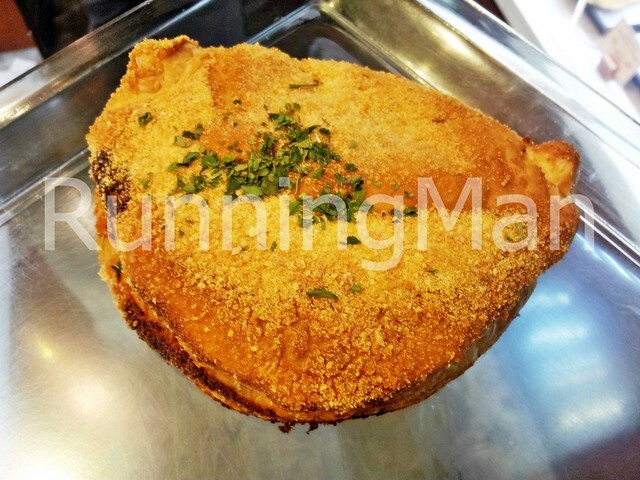 I like the outer crust which is crispy and somewhat firm, but not heavy. 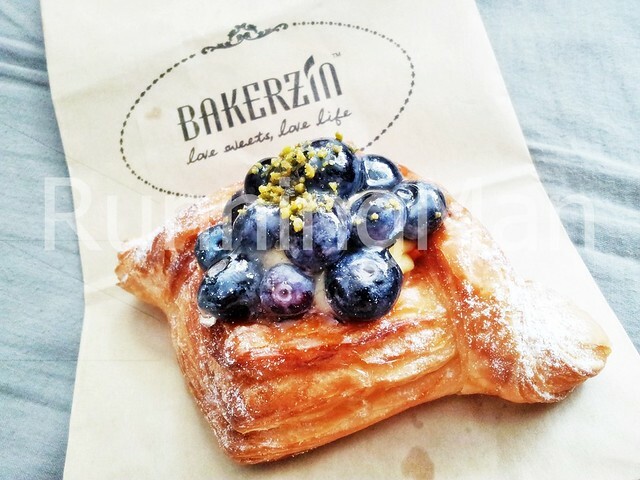 They have the sexiest looking Blueberry Danish I've ever seen! 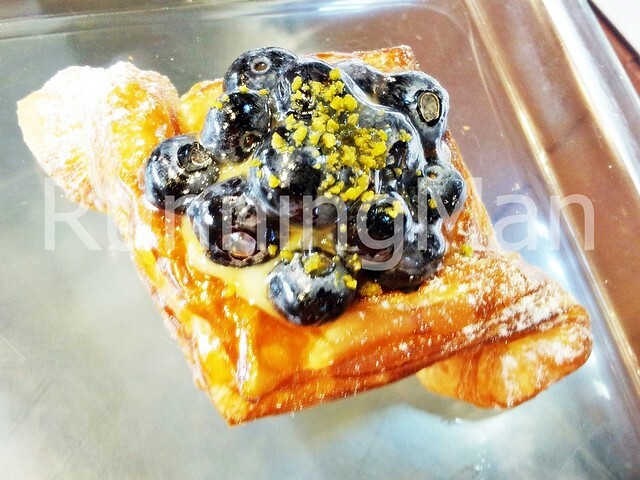 A crispy and flaky pastry diamond sits beneath a generous topping of fresh blueberries and custard, held together with a thin layer of jelly. Really good! The Ham And Cheese Danish Stick is rather average, though the pastry is nice. Slightly better than the versions you'll get at neighbourhood bakeries, due to the better quality ingredients used. 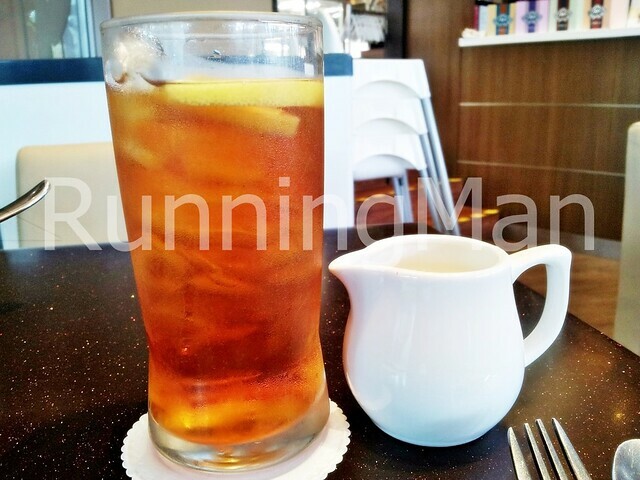 The Home Brewed Ice Lemon Tea is fresh, and I like that you're served the sugar syrup on the side, allowing you to control the amount of sweetness you want in the drink. 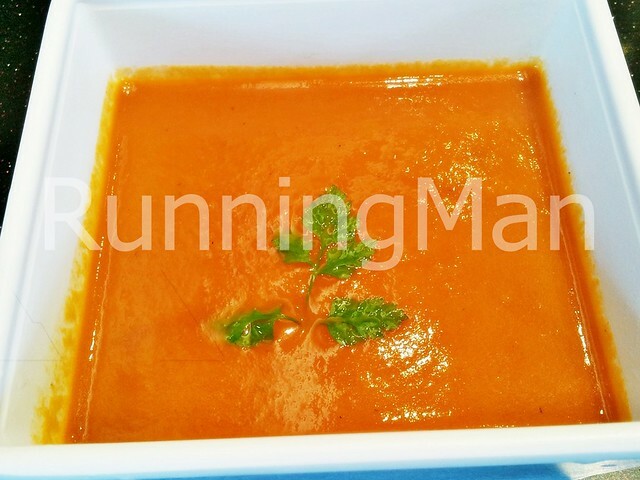 The creatively named Spicy Bloody Mary Soup is essentially a rich and thick tomato soup, with a slightly spicy kick from chili, granished with fresh herbs. While I loved the soup, I hated the square bowl it was served in, which made consuming it with a round spoon very difficult, as it leaves a lot of the soup stuck in the corners and sides. 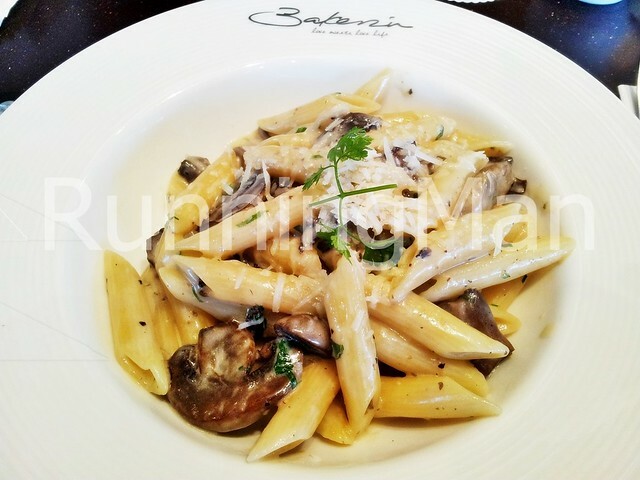 The Mushroom Penne has a nice al-dente bite, and it's well coated with the savoury cream sauce. 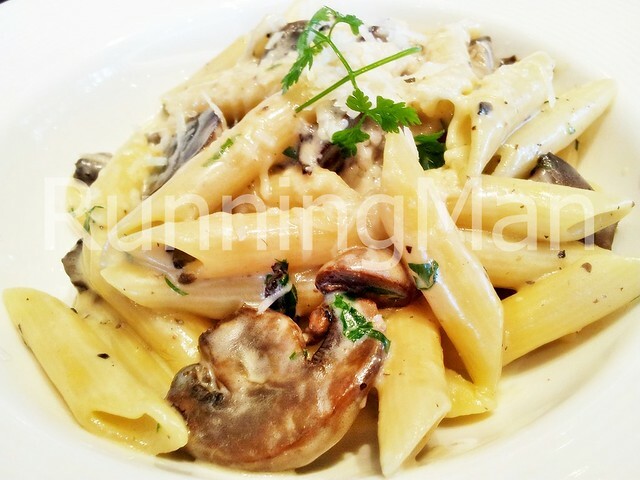 The trio of fresh field button mushrooms, shitake mushrooms and oyster mushrooms lend a meaty and earthy taste to the dish, while the cheese is sufficient enough to hold it together without being cloying or too thick. Excellent! 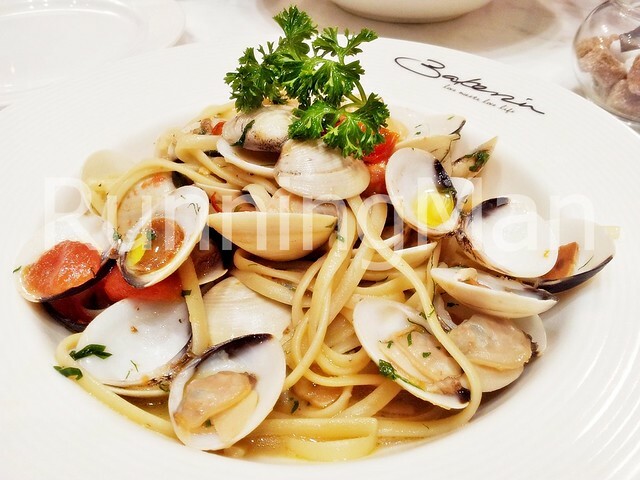 The Linguine Vongole features a generous helping of fresh clams and grilled tomatoes in a white wine and bird's eye chili sauce. 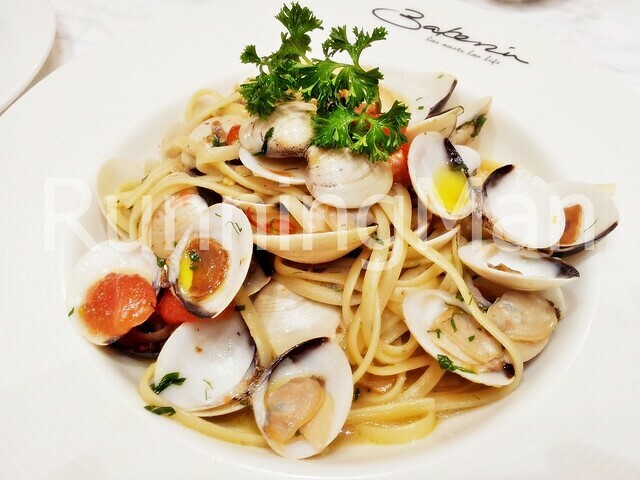 Great clean seafood taste with a hint of spiciness. Nice! 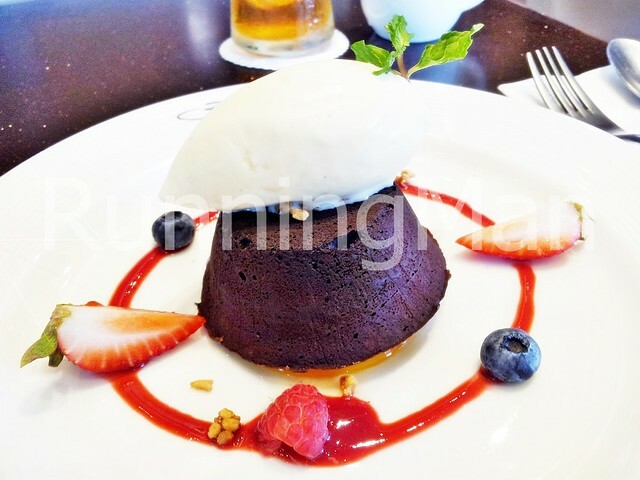 The signature Warm Chocolate Cake is absolutely lovely. 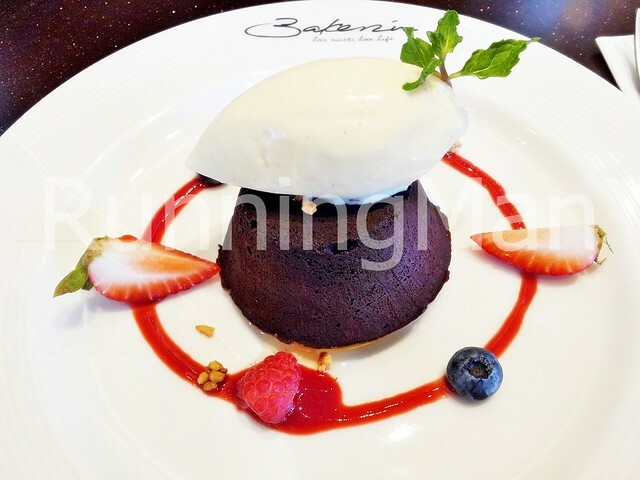 An inviting chocolate cake that is moist and warm inside with chocolate that oozes out when cut into, topped with a scoop of vanilla ice cream and garnished with fresh strawberries, blueberries, raspberries, and a strawberry sauce. Decadent, but I just couldn't stop eating it! 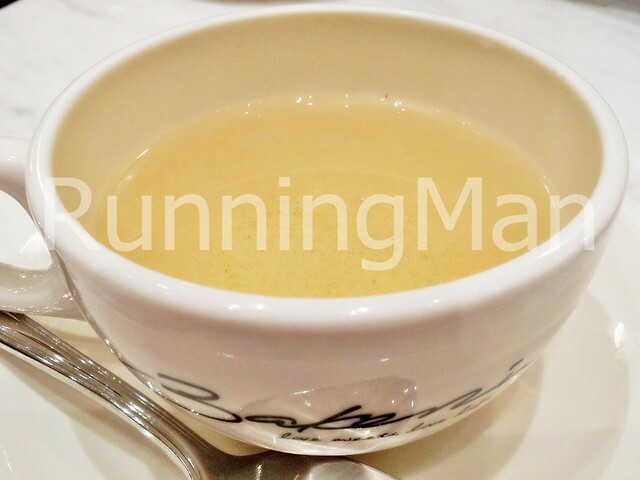 The Silver Moon Tea has a light fragrance and clean refreshing taste. 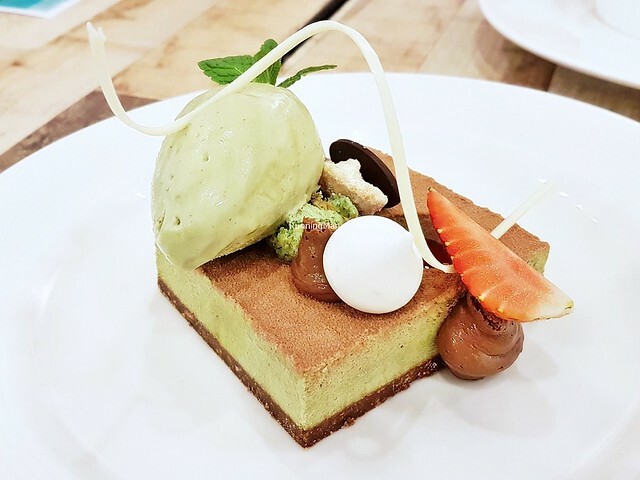 You can taste the notes of green tea and floral infusion! 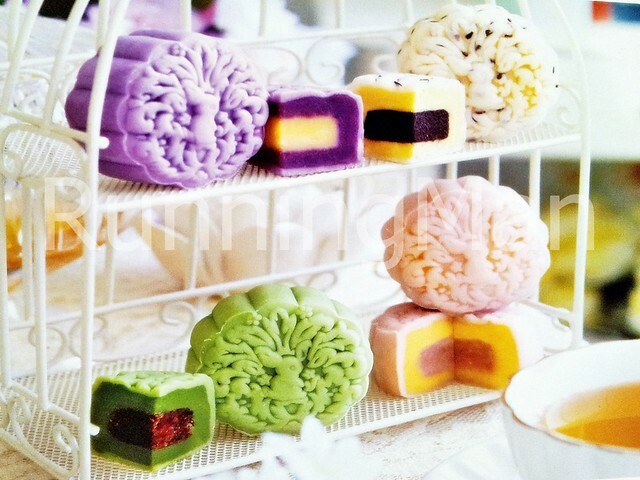 Update Aug-2013: Mooncake promotion of Bakerzin in August 2013. 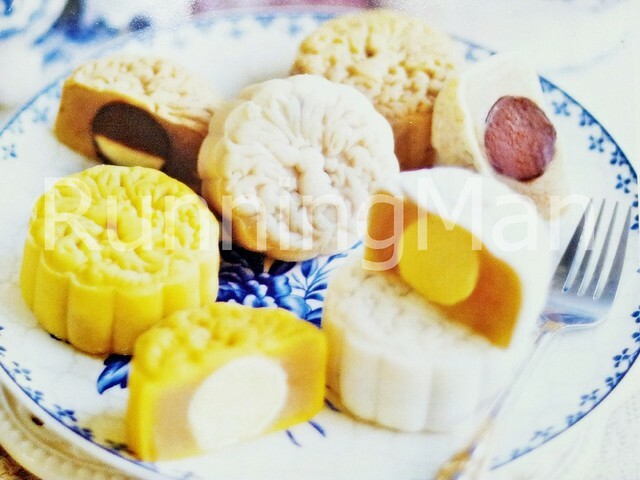 Includes traditional mooncakes, snow skin mooncakes, mung bean mooncakes, etc. 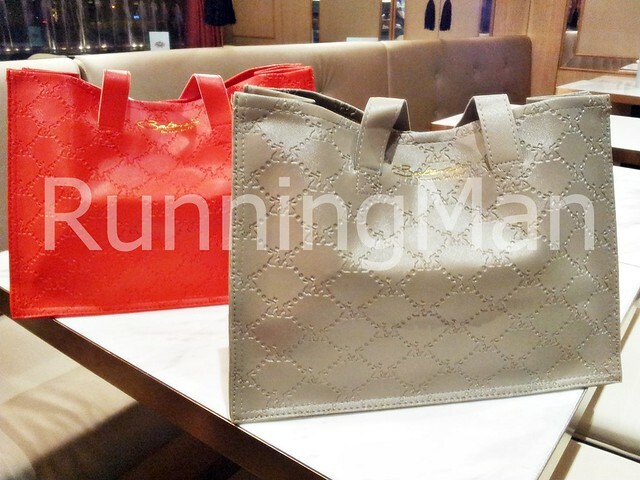 Every purchase includes a free Bakerzin Tote Bag, dine-in customers get a further discount. 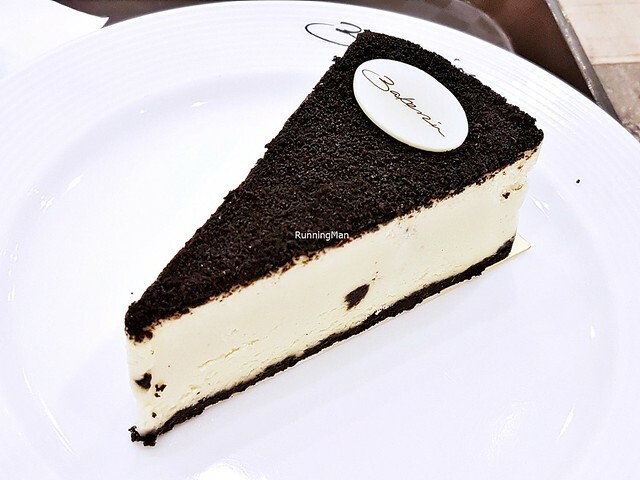 Update Mar-2016: Bakerzin is still doing as well as ever, even after 3 years. Their ambience, service, and food remain as good as ever. 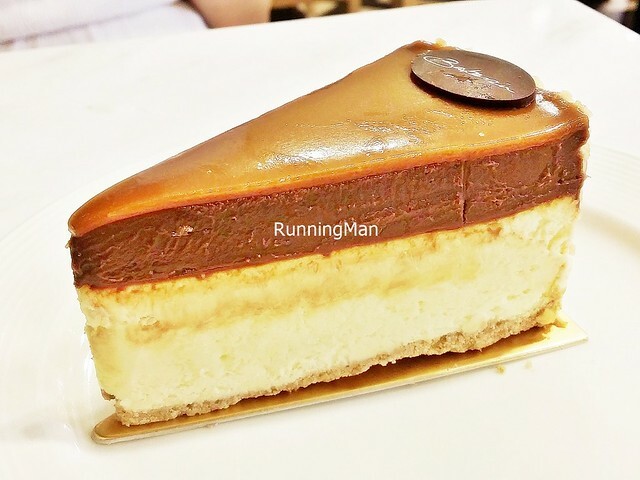 Their new Salted Caramel Cheesecake (SGD $8) is a delicious, rich, decadent dessert, with a layer of sea salt infused caramel blended with a premium Valrhona chocolate, over a creamy cheesecake, on a biscuit crumble base, studded with chopped almond nuts. 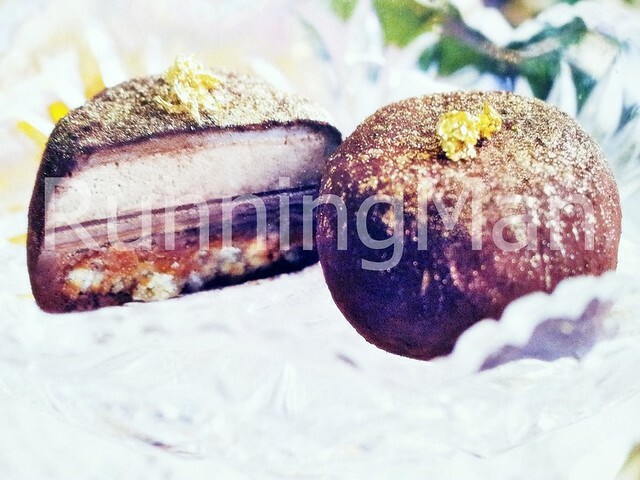 The result is savoury sweet, yet not cloying, with a creamy smooth texture contrasted with the crunch of the almonds. Highly recommended! 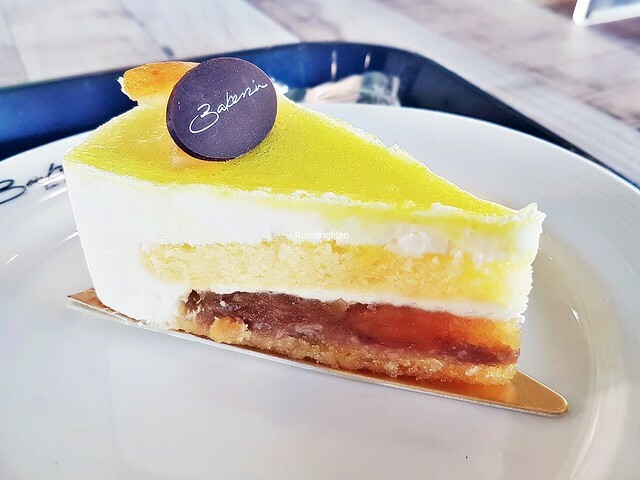 Update Mar-2019: Over 5 years later, and Bakerzin has consolidated their many outlets, slowly withdrawing from the mass markets of shopping malls, and setting up in more niche locales. Ambience remains casual and spacious, with warm wood against white tones, and sturdy wooden furnishings neatly lining the floor space. Service has become self-service these days, with ordering, payment, and collection of orders over the counter. I notice that staff clean up efficiently when diners leave. 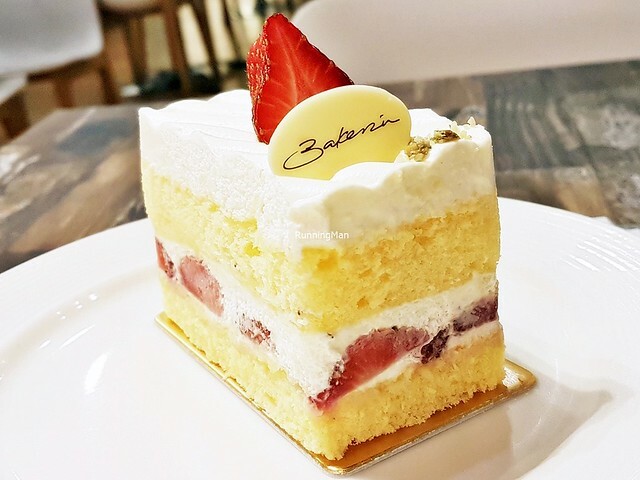 Food at Bakerzin has expanded from solely Western cuisine, and now includes Asian dishes as well, though the cakes, desserts, and pastries remain their speciality. Portions remain sized for individuals, though prices have adjusted to keep pace with most other cafes. Budget about SGD $20 per person for a meal here. 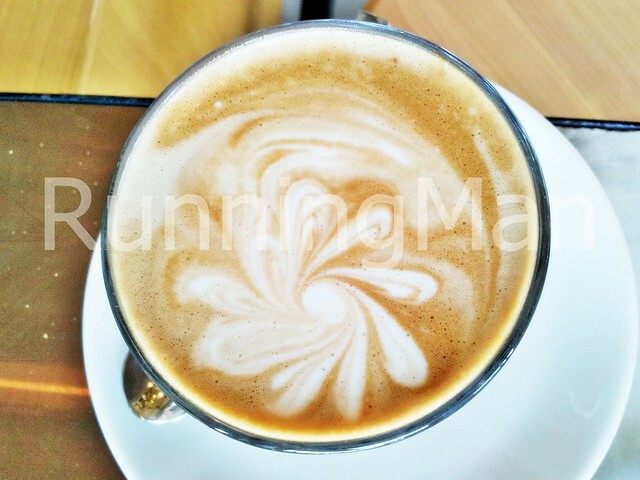 A below average Latte (SGD $4.50) here, somewhat underwhelming. 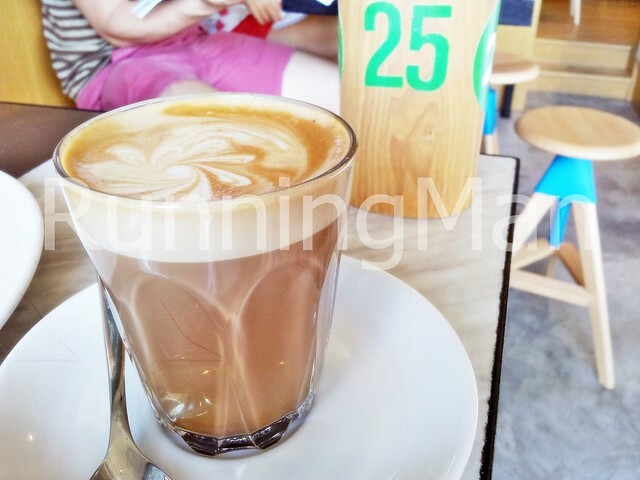 I like the Hot Chocolate (SGD $5) here. 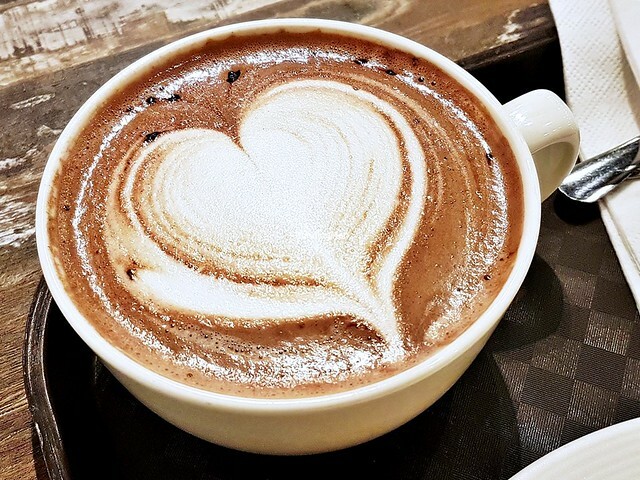 The hot chocolate is rich and medium thick, with a smooth velvety texture, and bold chocolatey sweet flavour. Good! Among the most poorly executed Affogato (SGD $6) I've had. 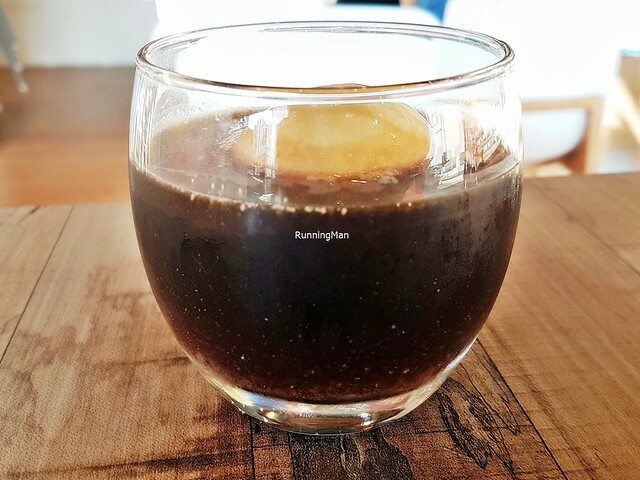 Not sure why, but they used chilled espresso, in a glass mug. 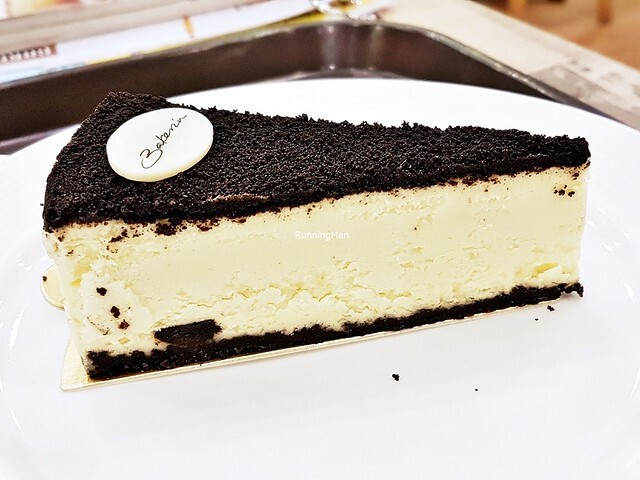 While the creamy smooth vanilla ice cream has a rich floral sweet flavour, the cool coffee absolutely doesn't help. 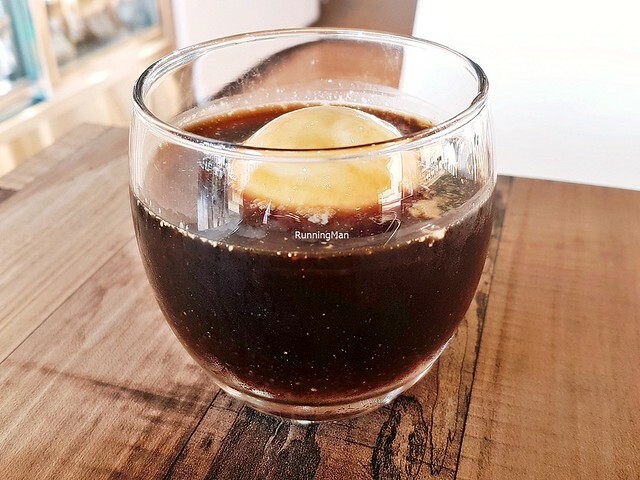 Like, why would anyone even use cold coffee for an affogato? Weird, best avoided. Skip this. 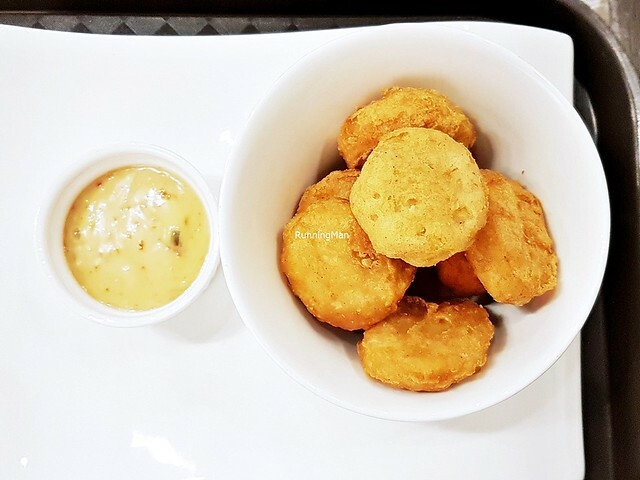 The Chicken Nuggets (SGD $4.80) here are more value-for-money than anywhere else. And of decent quality too. 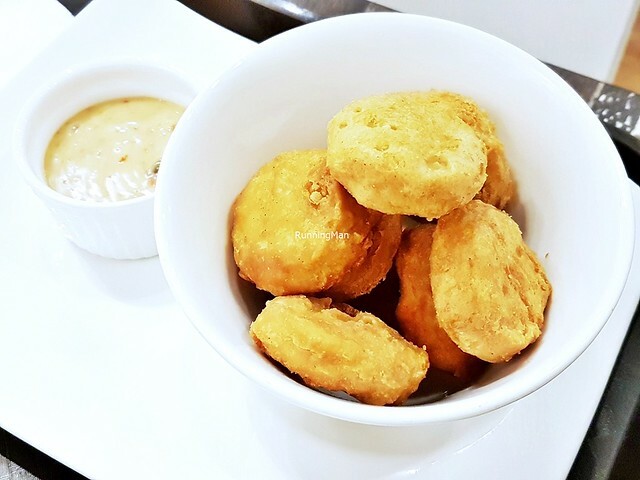 For this price, you get a bowl of 8 freshly fried chicken nuggets, hot and crisp and succulent, with good savoury salty flavour. 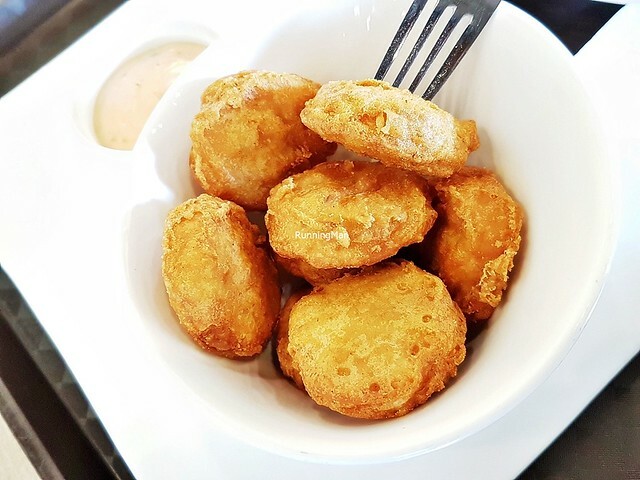 Served with a creamy tomato aioli. Will order again. 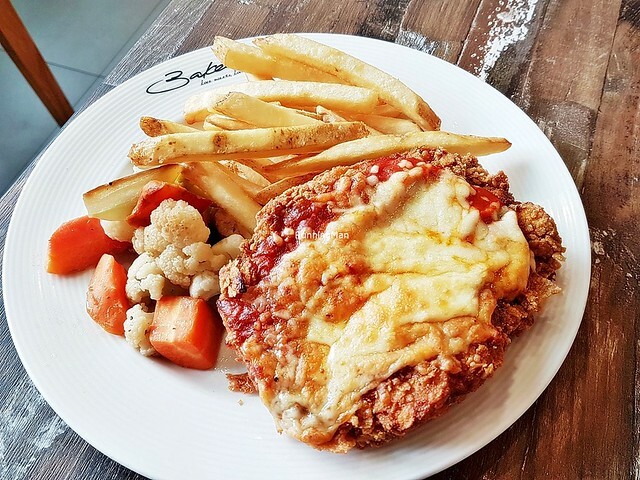 The Chiczella (SGD $12.80) is their version of a Chicken Parmigiana, only not as good. 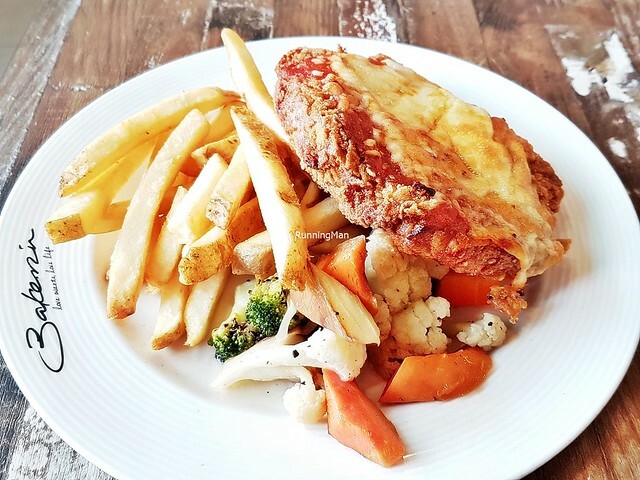 What I liked; the crunch of the cornflakes breaded into the chicken skin, the fatty chicken skin being easily removed, and the piping hot medium cut shoestring fries, which had good potato flavour. 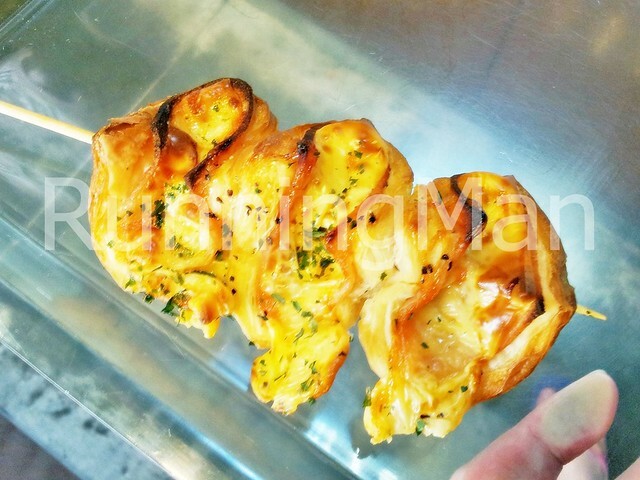 What I did not like; the grilled vegetables served cold, a sign of either grilled then chilled or being left in the open for too long, the use of frozen chicken which was near tasteless and stringy in texture, the overly oily frying, and the weak parmigiana tomato and cheese sauce. Skip this. 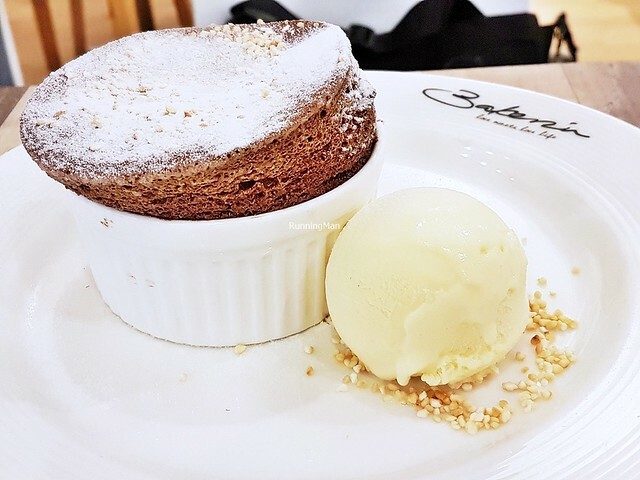 The Chocolate Souffle (SGD $9) features a warm, soft, moist, fluffy chocolate souffle, baked till it rises and forms a soft crust, served sprinkled with powdered icing sugar, alongside a rich creamy scoop of vanilla ice cream and crushed peanuts on the side. 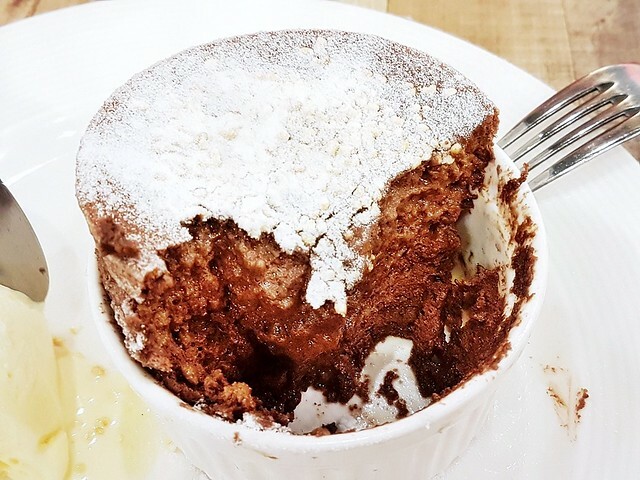 The souffle has rich, sticky chocolate flavour, boldly sweet in taste, feels so decadent. Contrasted by the smoothness of the ice cream, and the nutty crunch of the crushed peanuts. Good! The Pistachio Madness (SGD $8) features a soft, spongy pistachio mousse cake, filled with a raspberry puree, crisp meringue bits, creamy milk chocolate swirls, a crunchy dark chocolate medallion, a fragile white chocolate ribbon, a juicy strawberry slice, a soft pistachio financier, and a creamy scoop of pistachio ice cream. Lovely bold nutty sweet earthy sour chocolatey bitter flavours here. Complex and layered. Good! 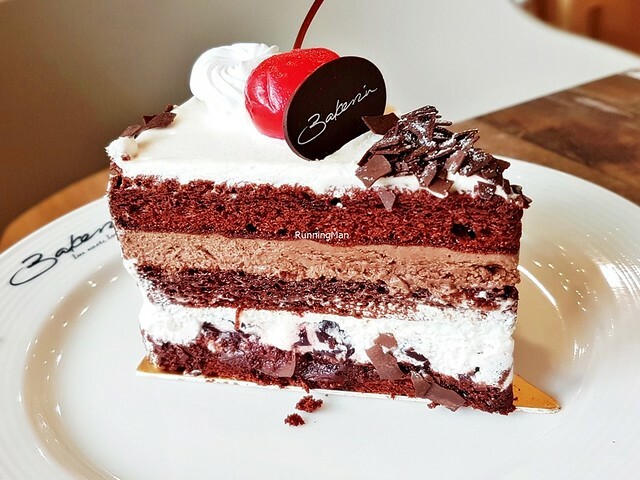 Loved the Black Forest Gateau Cake (SGD $8.80). 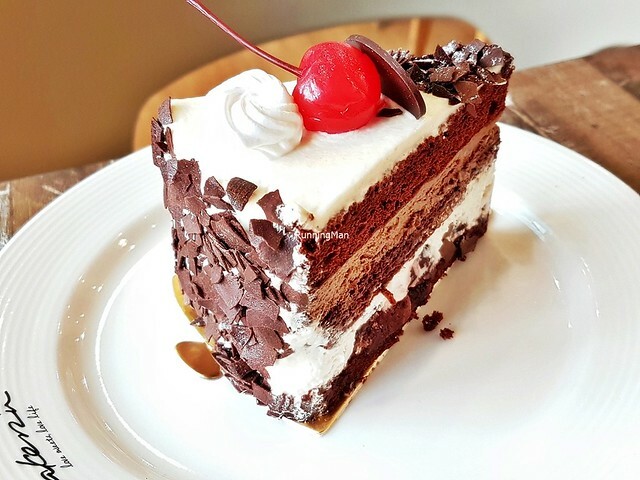 This features a soft moist chocolate sponge cake, layered with creamy chocolate mousse, and airy whipped cream infused with kirsch morello cherry liqueur. 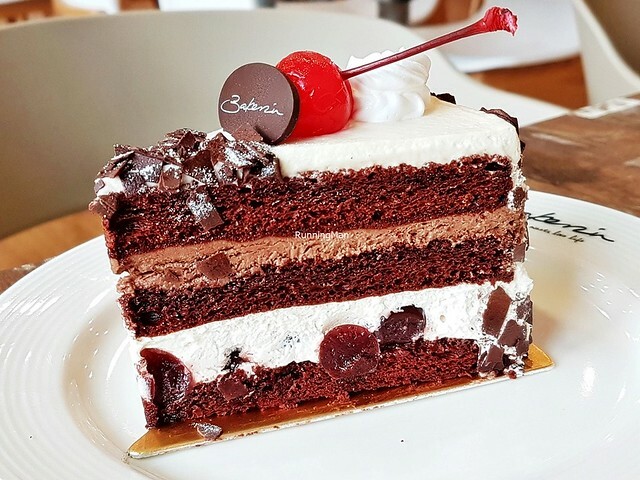 Studded with juicy brandy infused black cherries, sprinkled with chocolate shavings, and topped with a vibrant maraschino cherry and dark chocolate piece. Notes of sweet sour boozy flavours in this delicious dessert cake. Highly recommended! 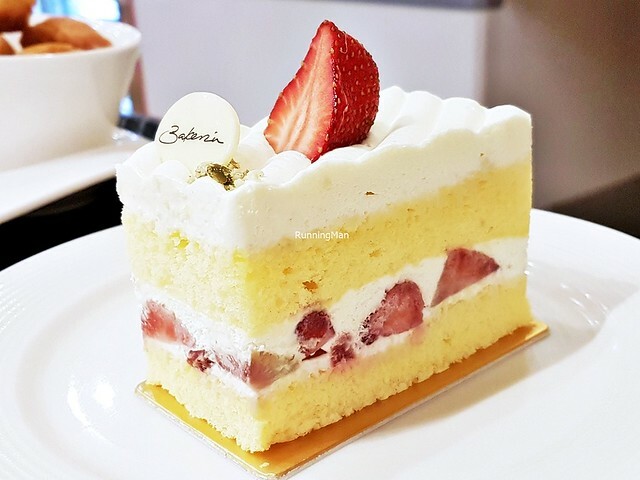 Loved the Strawberry Shortcake (SGD $6.80). 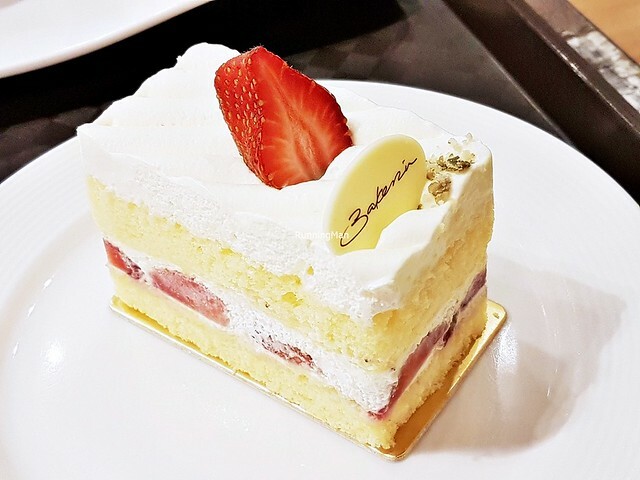 This features a light fluffy soft sponge cake, layered with airy freshly whipped cream, and studded with slices of juicy strawberries, garnished with a whole strawberry and white chocolate piece. Has a lovely fruity milky sweet flavour, very enticing. So light and pillowy soft, you can easily finish it on your own. Highly recommended! 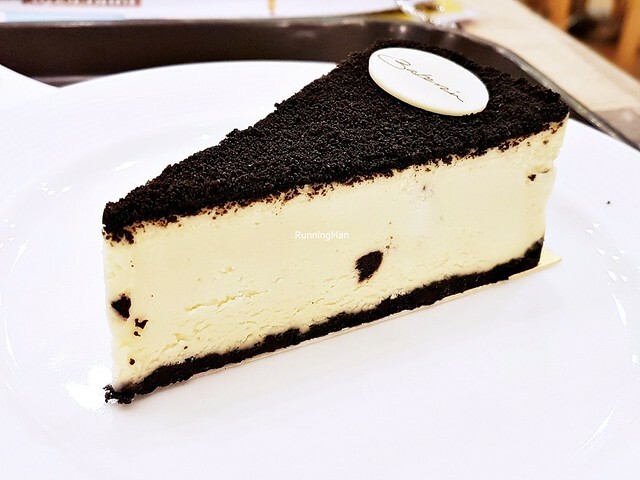 The Cookies & Cream Cheesecake (SGD $6.80) has a luscious, creamy rich and smooth texture to the cheesecake, with bits of grainy crunch from the Oreo cookie crumble base and top crust. Has a delicate sweet cookie flavour, very nice. Not as dense on the palate as other versions elsewhere, so it's easy to eat. 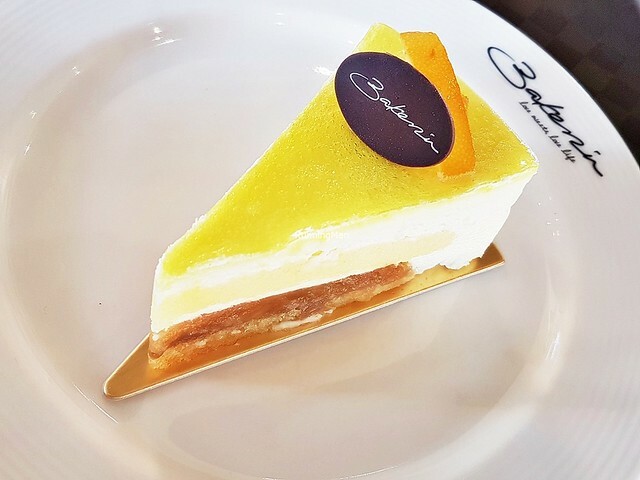 The Tropical Paradise Cake (SGD $5.80) has a airy creamy coconut mousse, set with soft butter sponge cake, gula melaka / palm sugar, juicy pineapple compote filling, and a pineapple glaze. Topped with candied orange zest slices. Has a bright bold floral fruity sweet flavour. Lovely, but best eaten in small portions, as the richness can get intense on the palate. 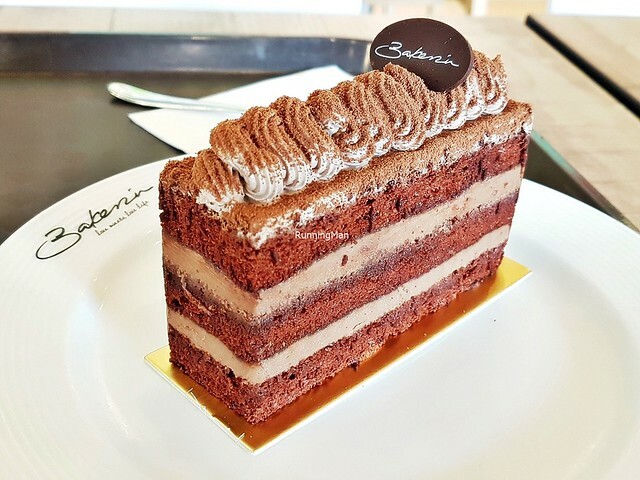 The Deluxe Chocolat Cake (SGD $4.50) has luxurious layers of rich chocolate cream, layered over soft moist chocolate sponge cake and thick chocolate mousse. 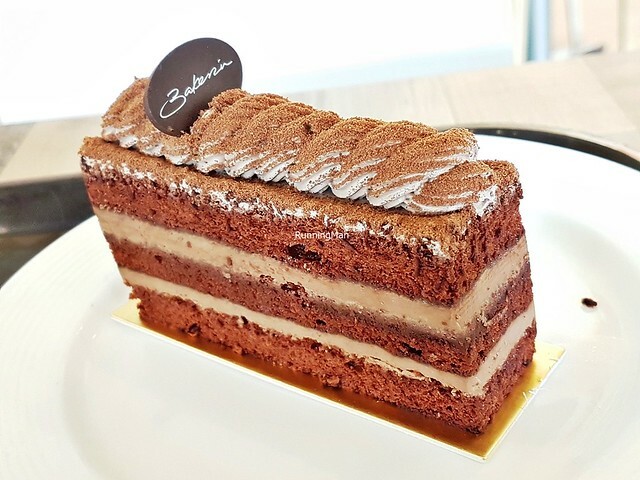 Completed with a light dusting of chocolate powder, this cake has a soft, airy texture, with good chocolatey bitter sweet flavour. Best eaten when freshly baked, as it tends to dry out when left to sit. A decent, straightforward, solid rendition of a classic chocolate cake dessert.